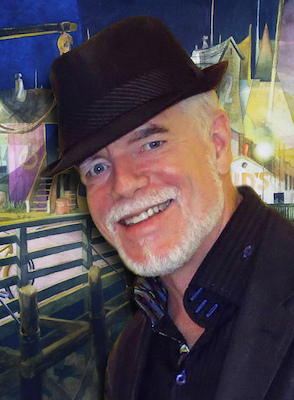 Chuck McPherson is an award-winning Intuitive Artist focused on painting in, and teaching, watercolor. 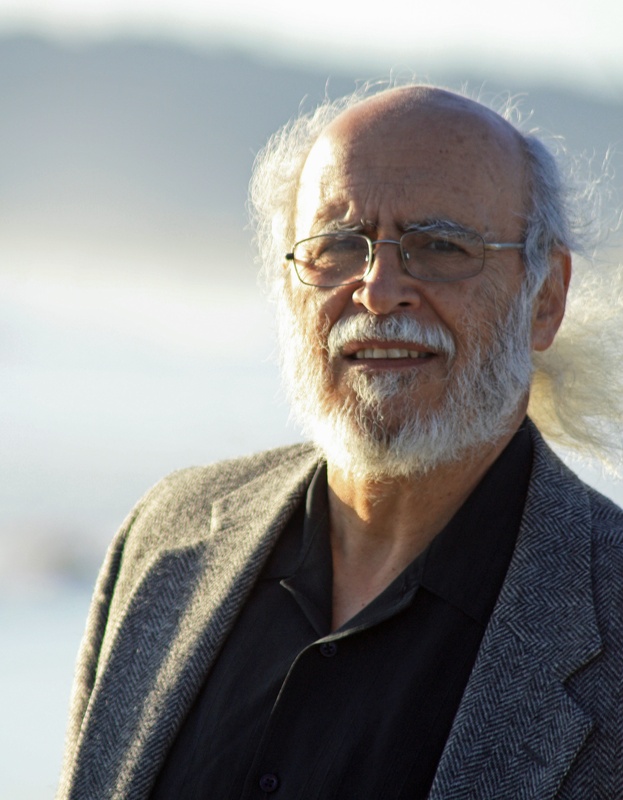 His formal education at San Diego State University and the Art Center College of Design brought forth a very strong designer and illustrator. Chuck's solid composition and rich color skills reflect over thirty years in the design world. With hundreds of awards for his paintings, he is often asked to juror art shows and lead no-nonsense workshops and paint-outs. Internationally, the artist holds three Signature Memberships with The San Diego Watercolor Society, National Watercolor Society and Western Federation of Watercolor Societies. 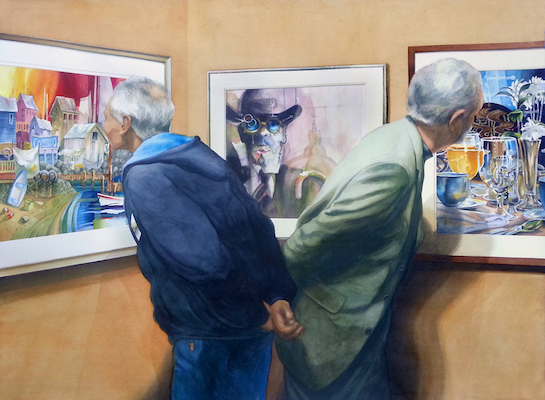 His transparent watercolor, "The Art Critics", recently graced the cover of Issue 29 of The Art of Watercolour Magazine, distributed in 36 countries. Chuck has served on the Board of Directors for the San Diego Museum of Art Artists Guild, Foothills Art Association, The San Diego Watercolor Society and National Watercolor Society. His popular artwork is in collections around the world and has hung at the Oceanside Museum of Art, the San Diego History Center, Marston House Museum, Muckenthaler Cultural Center and Olaf Wieghorst Museum and Western Heritage Center. 2018 begins with Chuck participating in an invitational exhibition of San Diego County Watercolor Artists in conjunction with the American Watercolor Society's 151st Traveling Exhibition, at the California Center for the Arts, Escondido (CCAE) Museum. Since graduating with a degree in art education from Oregon State University, Jami has maintained her love of watercolor painting. Born in Bend, Oregon, but raised as a Navy brat, she had a unique opportunity to see and appreciate the wide-open landscapes of America and the scenery of many foreign countries. After marrying her career Marine husband, she taught art for many years in public schools across the country and overseas. Jami recently retired from full-time teaching and now spends more time pursuing her love of plein air watercolor painting. She also offers watercolor lessons at her home studio. And recently she published her first ebook for Amazon entitled, How To Paint A Lighthouse In Watercolor. Jami has been a member of various art guilds and has won numerous watercolor awards at many local and regional art shows over the years. Presently, she is an active member of the San Diego Watercolor Society. 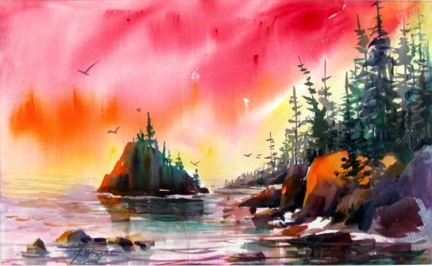 Keiko has been a professional watercolor painter since 2005. In recent years she has been invited to exhibit her works in many key watercolor exhibitions in the world. Also a sought-after workshop instructor, she has completed successfully over 50 workshops around the world since 2011. She had her paintings published in leading art magazines in the U.S. and Europe. She self-published several books of her art in 2012 and 2013. She works both in the studio and en plein air. To find out more about Keiko and her show/workshop schedule, visit her website. Elaine Harvey works in transparent watercolor, acrylic, and mixed media in a style which combines realistic and abstract elements. Her more than 70 awards include those of the American Watercolor Society, Rocky Mountain Watermedia Society, San Diego Watercolor Society’s International, Watercolor West, the Signature American Watercolor Exhibition (Fallbrook) and the Adirondacks Exhibition of American Art. 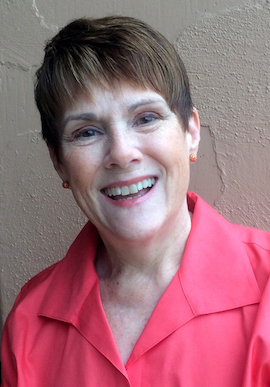 Jury assignments have included National Watercolor Society and many other civic and art society competitions throughout the United States Elaine currently teaches classes and workshops for the Athenaeum and UCSD Extension. You can contact Elaine via email here or visit her website here. Painting is the entrance to that deep place within myself where I am free to explore my emotional response to that which surrounds me. Art has always been a part of my life and I cannot image an existence without it. In my work, I tend to select subjects that have the potential to push one of these creative boundaries: the interplay of light and shadow, texture, color, and design. Because of my early training as a color separator, I have become particularly intrigued by the interactions of pigment and how they combine to create kaleidoscope of effects. I use these effects to heighten my means of self expression. My influences are many: the study of art history, the wonderful artists that I have had the privilege to have as workshop instructors, my creative maternal family, and environment. I recently rediscovered the art of plein air painting and continue to enjoy the exploration of color and design in my studio paintings. I am ever striving to improve upon my skills as a painter and instructor. Born and raised outside of Youngstown, Ohio, in the small town of McDonald, Nancy Oleksa has been involved in the visual arts from her earliest years. Having her artistic talents recognized early enabled her to develop a portfolio from which she received a full scholarship to the Art Institute of Pittsburgh. There she developed her skills and used her degree in Visual Communications to propel her into a position as first a color separator and then an illustrator for the American Greetings Corporation. It was at American Greetings that she diversified her abilities to include calligraphy, character development, writing and design. 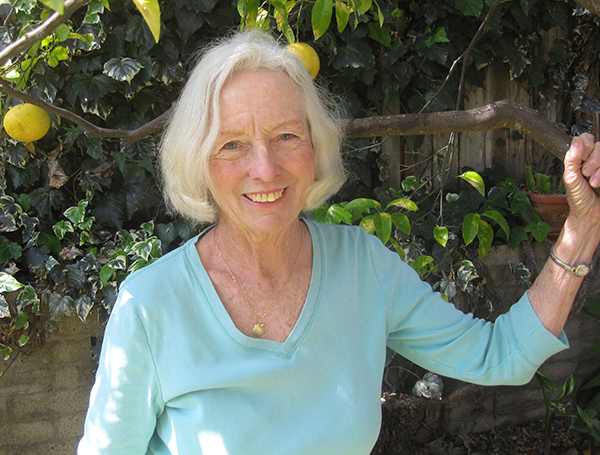 It was here in San Diego that Nancy Oleksa’s freelance career as an artist was realized. She became illustrator and graphic artist for the cities of Santee and El Cajon as well as lead illustrator for A La Carte Art Studios. 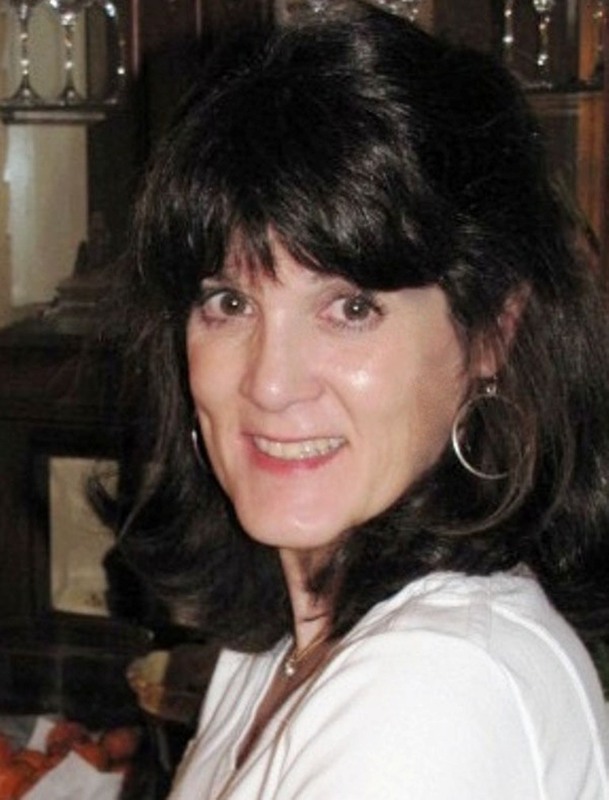 Her clients included Bank of America, Century 21, the American Dental Assoc., and many others. After the birth of her daughter, she realized a love of children’s books, and began to use her skills to explore the world of illustration for children. Her art experience grew to include illustration for Cricket Magazine and Atheneum Books. She then became an adjunct instructor for Palomar College in the Community Education Department and remained in that position for 23 years. This award winning artist is now a popular jurist, workshop and watercolor instructor known for her passion for color and light. 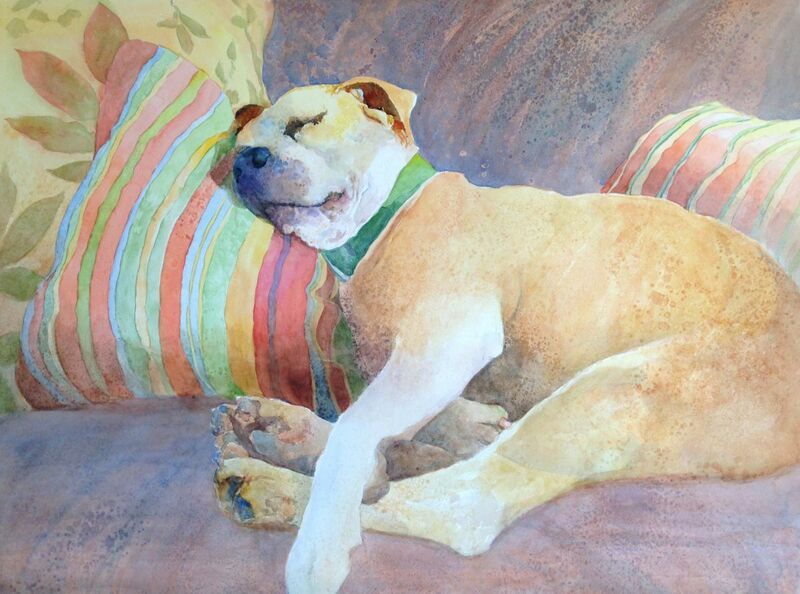 She has enjoyed instructing watercolorists in San Diego County for over 30 years. 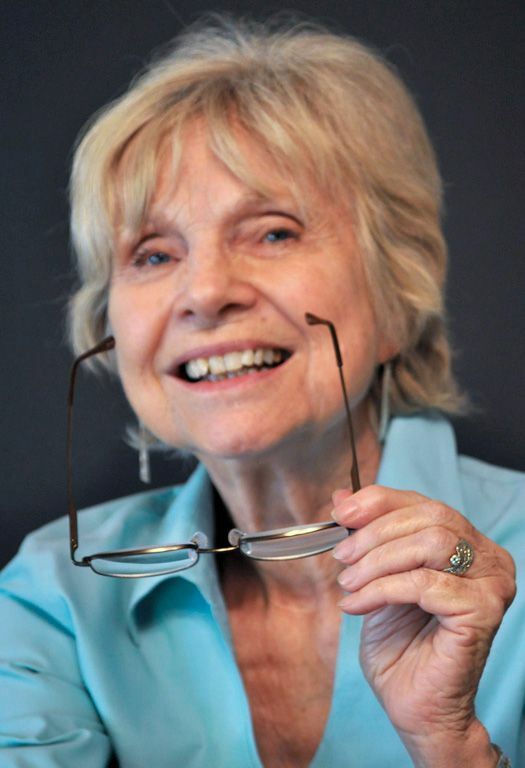 To learn more about Nancy and her work, please click here. 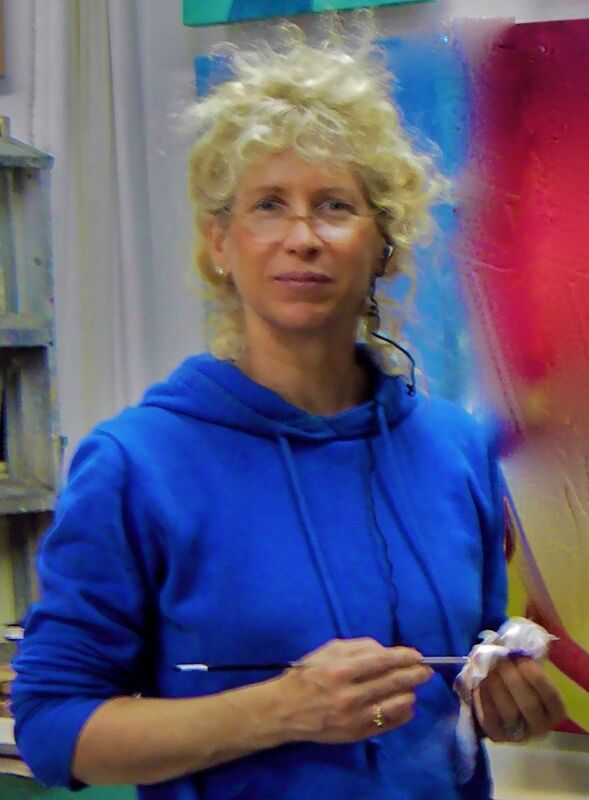 Risë Parberry, SDWS, NWWS, holds a Bachelor of Arts Degree (Painting Emphasis) from the University of Idaho as well as a Secondary Teaching Certification from Boise State University. 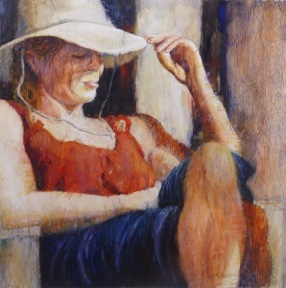 During the twenty-five years that she and her husband, Gary, raised their family and operated their grain farm in northern Idaho, she also taught oil and watercolor painting through the Washington State Community College Extended Learning Program, the Spokane Parks and Recreation Corbin Art Center, and various watercolor societies and other venues. 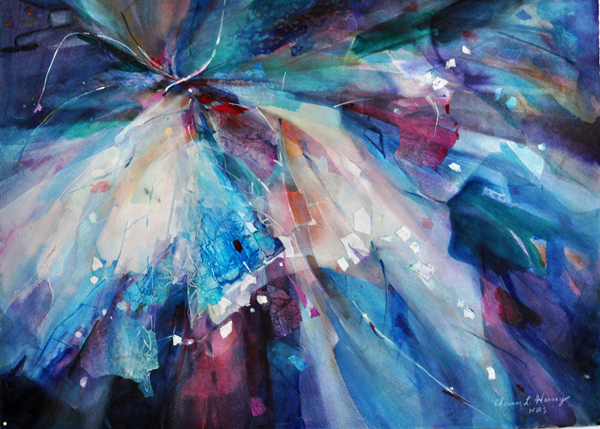 Her acrylic abstract painting, “Fossil Fusion”, was awarded Third Place in the 2011 SDWS International Juried Exhibition, and her abstract transparent watercolor, “Liquefaction”, was awarded Second Place in the 2016 Watercolor West Juried International Exhibition. Risë will be presenting a painting program for the Watercolor West Demonstration Series on November 22, 2017 at the Brea Civic and Cultural Center. Since moving to Pacific Beach in 1999, Risë has enjoyed being active in the San Diego Watercolor Society and served as president from 2002 through 2004. Risë can be contacted here. Carol Mansfield is a native of Chicago, who now enjoys living in San Diego. She has been drawing and painting since children's art classes in Oak Park, Illinois -- then adult work at Denison University, the Art Institute of Chicago, and the Institute of Design at Illinois Institute of Technology. 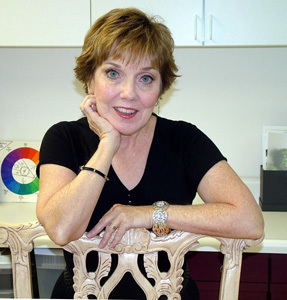 After completing a college major in Art and a minor in Mathematics she taught for several years, then entered the commercial art world as a graphic artist and art director in the publishing industry. 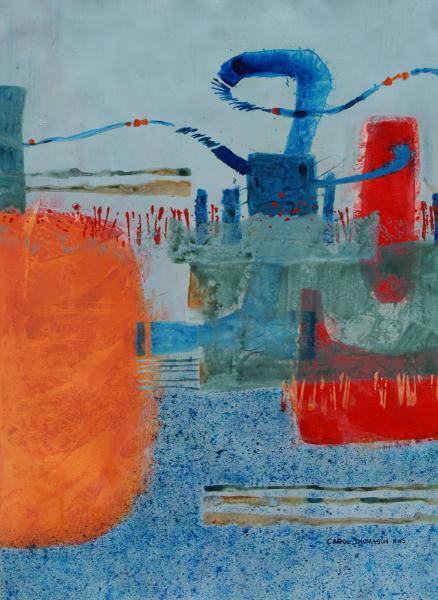 Her current paintings are abstract, non-objective acrylic, and experimental water media work. You can learn more about Carol's painting here. Cris has been painting and drawing for over 25 years. 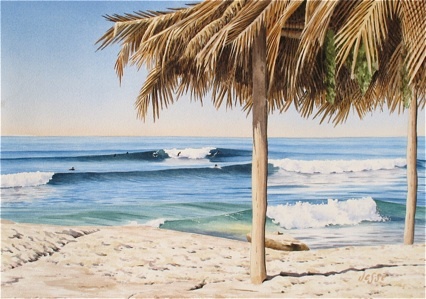 Her award winning work in watercolor is held in many private collections and may currently be seen at the San Diego Watercolor Society and at www.crisweatherby.com. She teaches two weekly seminars in her private studio in Encinitas as well as annual classes for the San Dieguito Art Guild. Cris is a former Workshop Director for SDWS. Richard Hawk is a painter whose work explores themes of unity, duality, beauty, decay, and eternity. His approach involves presenting elements which contrast on a number of levels within a unified composition. Hawk’s artworks hang in private and public collections around the world and have appeared in scores of exhibitions and galleries. His paintings are recognized by their strength of underlying design, expressive intensity and bravura paint handling. The result: unique and highly charged statements open to a variety of interpretations. 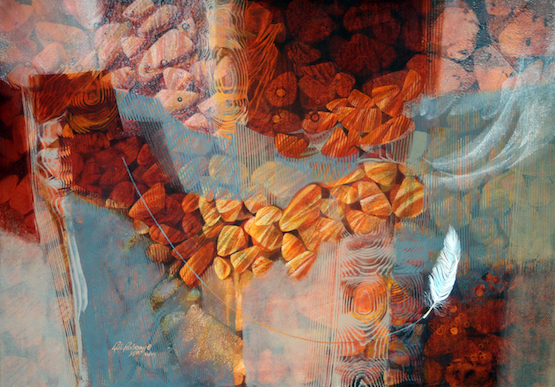 Hawk works in water media on paper, oil on canvas and oil on copper. More about the art and Richard Hawk can be seen at www.hawkstudio.com. ​I was born and grew up surfing in San Diego, anddidn’t start painting until I went to Brigham Young University in Hawaii as an art major. Learning how to paint in Hawaii played an important role when I was developing artistically. BYU-H is a small university in Laie, only a few miles from the North Shore on Oahu. The beaches there are some of the most beautiful places I have ever been, and I was constantly challenged to capture what I saw. The water was beautiful, the beaches were great, and I loved the way the people interacted with the ocean. I learned about watercolor by painting the tropical fish I would see when I went snorkeling. The subject matter I lovedwas always ocean related, and to this day I still turn to the ocean for inspiration. ​After living in Hawaii I moved back to San Diegoand got a job with the City as a lifeguard. That lets mework at the beach during the summer, and gives me all winter to concentrate on art. My work continues to beabout what I look at, and what I want to share with others. My favorite paintings are when I can show what those who surf see and take for granted every day. Not just the act of riding a wave, but the whole surf culture that surrounds it, and the environment it happens in. I love the challenge of painting abreaking wave, or showing someone getting ready to paddle out to surf. And yet, I try to find things that will be more than just a pretty picture. My work has been compared to both Andrew Wyeth and Norman Rockwell. Not because of technique, or color scheme, but because I try to evoke a specific sense of time, place and emotion, like those artists did so well. I am constantly challenged by watercolor, andafter more than twenty years of full time painting, I feel like I am still learning. I have enjoyed teaching classes and leading workshops because I can learn fromeveryone in the class. Everyone uses the medium differently, I am always studying the work of othersand being inspired by what they can do. And as for my work, my goal has remained the same since I first picked up a brush, which is sharing with a viewer the allure and beauty of the ocean and all that happens around it. For More information about Jesse and his hard go to his website. Helen Hayes graduated from Ball State University (Indiana) earning a degree in education with a major and a minor in art, which led to a career in art education (grades K-12). Helen also attended institutes with The California Art Project and became a Teacher Leader helping teachers to become more proficient in teaching to the art standards and to gain skill and competence with art techniques. 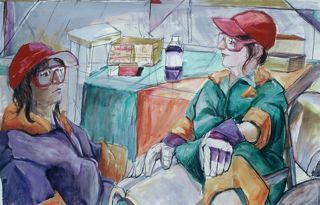 She has presented watercolor classes and worked with CDE developing California Art Standards. Native Californian Joe Garcia is an established landscape and wildlife artist who lives and paints near the small mountain town of Julian, California. The natural setting amidst oaks and pines, and the golden hills of Southern California provide endless inspiration and subjects for his art. Encouraged by friends and family to pursue an artistic career, Joe earned a Bachelor of Fine Arts degree with an advertising/illustration emphasis from the Art Center College of Design in Los Angeles. He worked as an illustrator and graphic designer for 13 years, then left the commercial field to focus full time on the fine art side of his career. 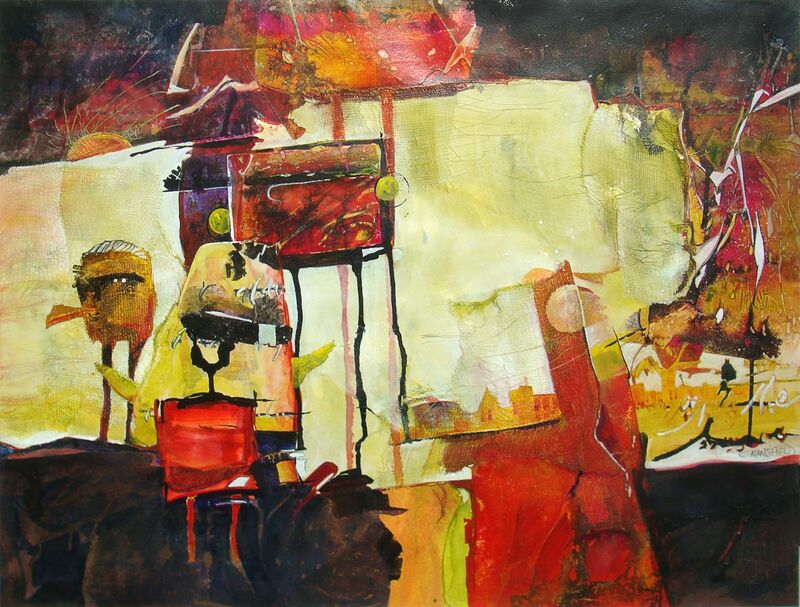 Today Joe continues to paint in oil and watercolor, and emphasizes composition, value and spontaneity in each medium. His paintings reflect his love of nature in landscapes, birds, mammals and a variety of other themes on location and in the studio. Whenever he travels his paints and camera are ready for capturing the visual moment. Garcia's original paintings and limited edition prints may be found in galleries and private collections throughout the United States and in Canada, New Zealand and Europe. Joe’s art has appeared in numerous magazines, including Western Art Collector, Southwest Art, The Artist Magazine, Wildlife Art, and Watercolor Magic. North Light Books produced his books Mastering the Watercolor Wash and the Watercolor Bible, and included his work in several other publications. In 2010 he was chosen to be a judge for the Federal Duck Stamp contest. Joe Garcia's enthusiasm and dedication bring him continued achievement and success as he paints what he loves. You can learn more about Joe and his art by visting his website. 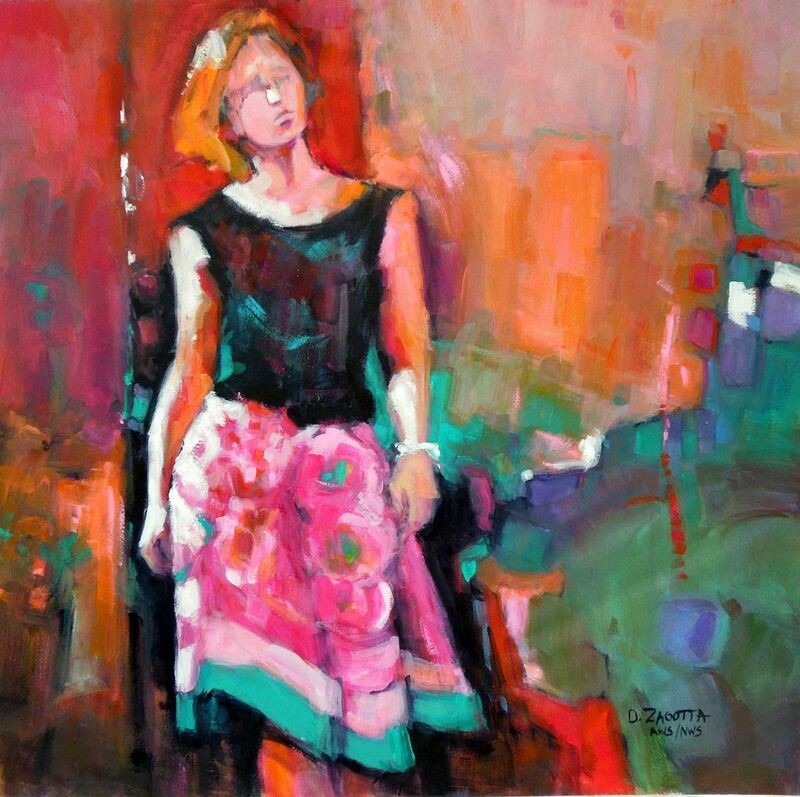 Active professionally for over 25 years, Donna Zagotta is an internationally recognized artist, teacher, juror, and writer. She has accumulated numerous awards and is a Signature member of the American Watercolor Society, National Watercolor Society, Watercolor West, and Transparent Watercolor Society of America. 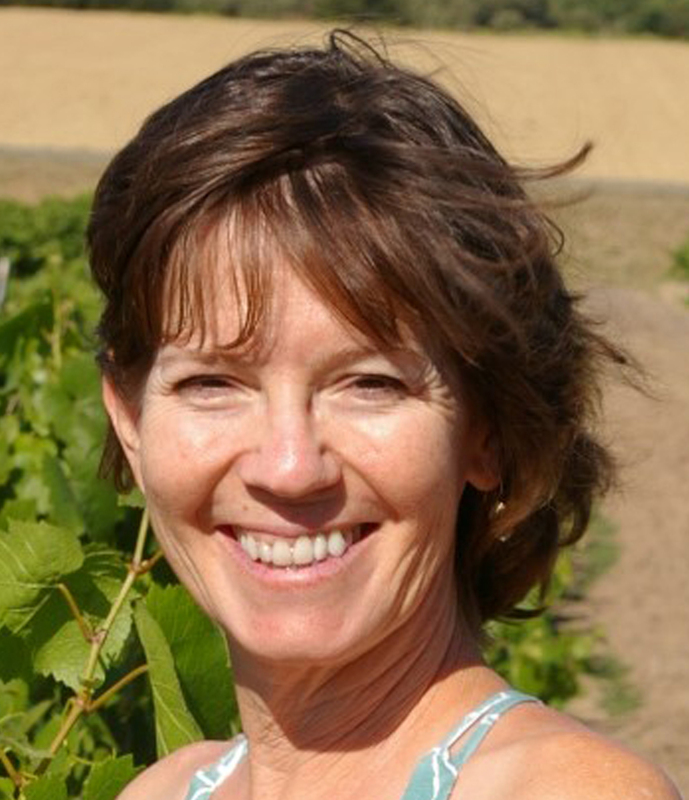 Her work appears in numerous publications and she has been teaching classes and workshops since 1990. I have been involved in the business of art ( to speak) far the better part of my life. In my more formative years I was that quiet, talented kid in the back of the room. I went on in my early adult years to finish my education here in California. I grew up a Detroit brat. Cars not art. Through a twist of fate I became a business owner in the Sixties (Commercial Signs) and that seeded my life of art. Around the same period I also taught at Palomar College. Now I spend of my time painting, traveling and competing at a national level. I hold Signature status at SDWS, WW, TWSA, NWS and CWA to mention a few. Life is good. I am a traditional Watercolorist. Paper, Paint (watercolor only), Brush and water. Water Media is an all together different animal. I call it play time, mixed media. The results can be spectacular and extremely creative, but not traditional. Pure watercolor is very demanding and unforgiving. Find a good teacher and expect to invest many hours to create an acceptable piece. Never paint the human form or faces unless you are well grounded in anatomy and life drawing. NEVER! Use twice as much color as you normally use. Use strong values for depth and contrast. Paintings with strong value show the best, even bad ones. Less is more. Crop out the junk and extraneous detail. SIMPLE! SIMPLE! No skinny matts. Err to oversize. Can’t be too big. Plain, simple mats. It’s about paintings, not matts and outlandish frames. Most importantly, HAVE FUN. and, you can't learn if you don't paint. 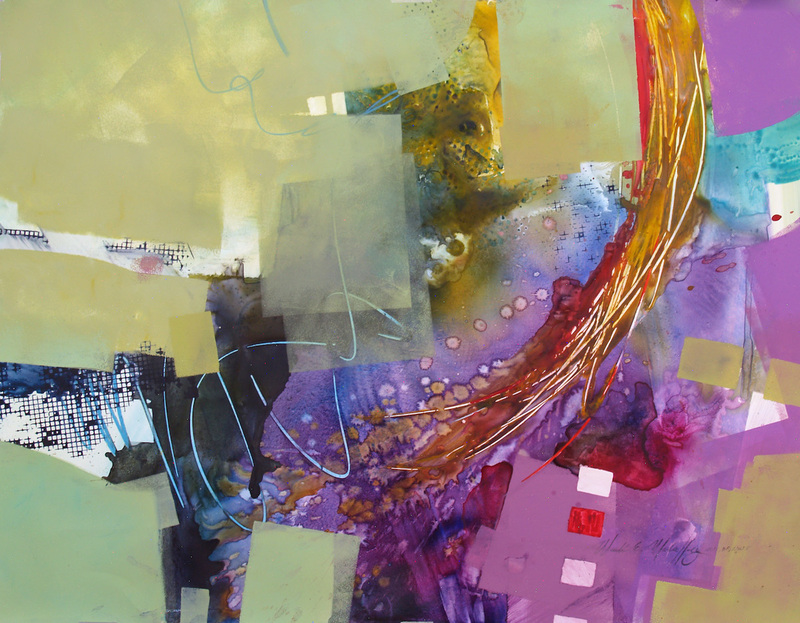 Carol Thomason uses fluid acrylics, watercolor, collage, pencils and watercolor crayons to create the mixed media paintings in her non-objective series she calls "Lines of Communication." The series is about the Internet, cell phones, computers--the communication technologies. Using traditional design principles with an innovative, experimental approach, she creates compositions that draw one's attention from a distance...and textures that delight the eye up-close. 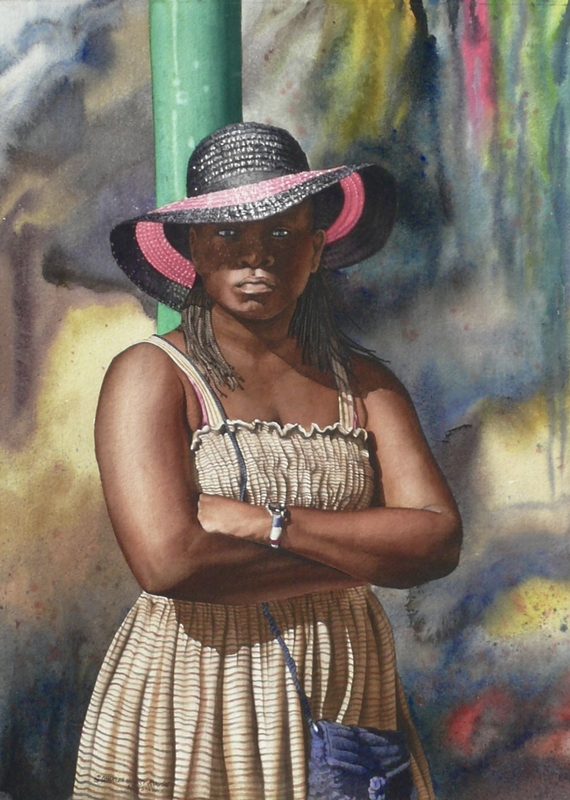 These paintings have won more than 70 awards locally and nationally in major exhibits with National Watercolor Society, American Watercolor Society, Western Federation of Watercolor Societies and San Diego Watercolor Society. 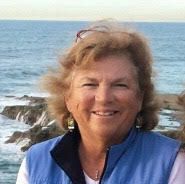 Wishing to share her enthusiasm for creating art, Carol has taught classes and workshops for the San Diego Watercolor Society, Rikki Reinholz Studio of Design, San Dieguito Art Guild, Clairemont Art Guild, and Gateways Gifted Enrichment Program, San Diego Unified School District. 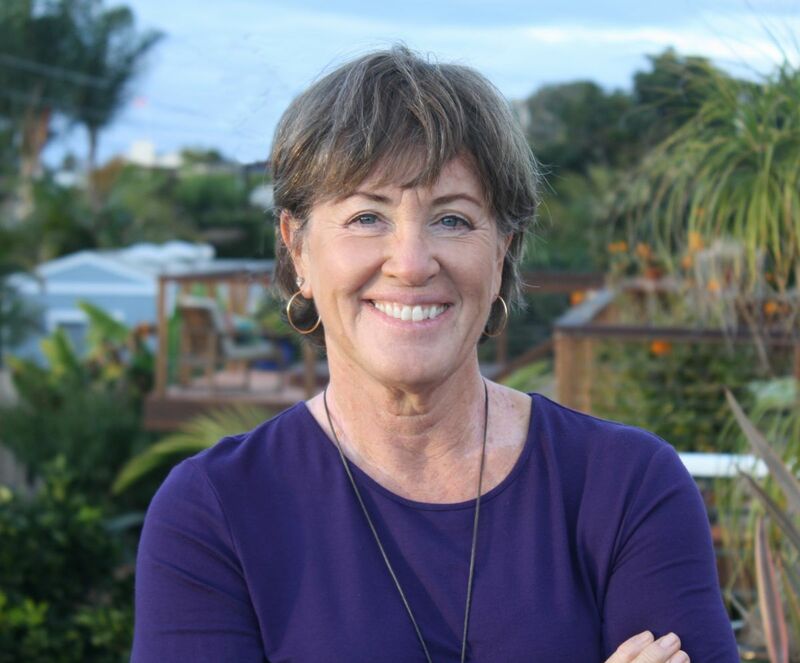 Carol has been a juror for the San Diego Watercolor Society, the San Diego Art Institute, San Diego County Fair, California Cinema Art Walls Project, San Dieguito Gallery, and Mesa Community College. Graduating with honors from the University of California at Santa Barbara with an Art History major, Carol then went on to complete a Teaching Credential at California State University at San Luis Obispo, and then did master's degree work in Art History at the University of Michigan in Ann Arbor. Carol has been granted Signature Status in the National Watercolor Society, San Diego Watercolor Society, and Western Federation of Watercolor Societies. 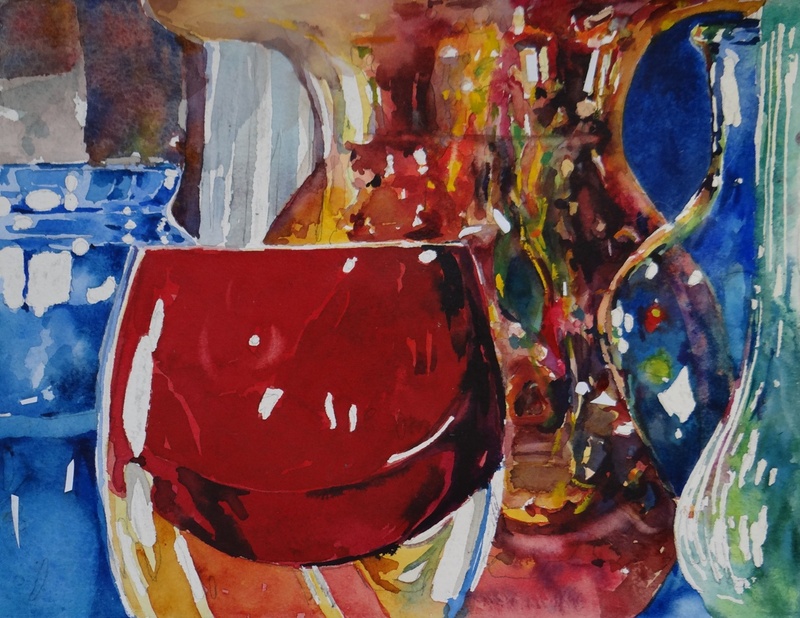 She is honored to have served as president for CAG and San Diego Watercolor Society. Her paintings reside in collections across America. Carol replied, I always think my next painting will be my best! Born and raised outside Philadelphia, Julie spent many childhood hours drawing horses and painting in oils. This lifelong love of art lead her to a BA degree in art (University of Delaware) and graduate studies in art and art history (Tyler School, Temple University), followed by many years teaching art in grades K-12. A move to California in her mid-twenties allowed Julie to pursue her interest in outdoor activities. Upon retiring from teaching, she began her adventure with watercolor. Interesting shapes and strong value contrast are important elements in Julie’s paintings, which tell stories of everyday people. As a regular contributor to SDWS monthly member shows, she has received many awards for these paintings. Teaching is still part of Julie’s artistic life. She instructs 2 classes in the SDWS Beginner Workshop series, as well as teaching classes for adults and children in the SDWS Military Families program. In addition, Julie has given demonstrations and workshops at other local arts organizations. To learn more about Julie and her art please visit her website by clicking here. 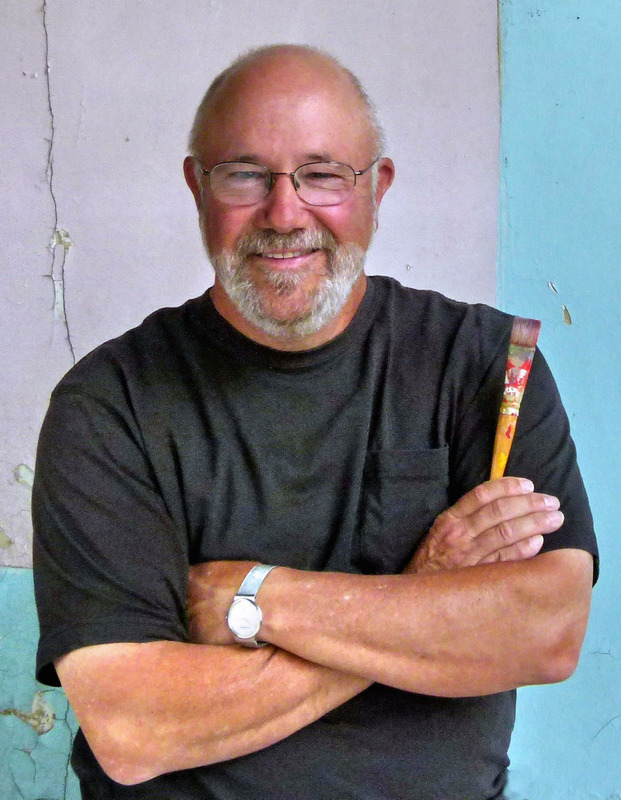 Award-winning artist and much sought-after watermedia instructor, Jim’s thorough understanding of what makes a good painting results from over 45 years as an art director, graphic designer, painter and teacher. 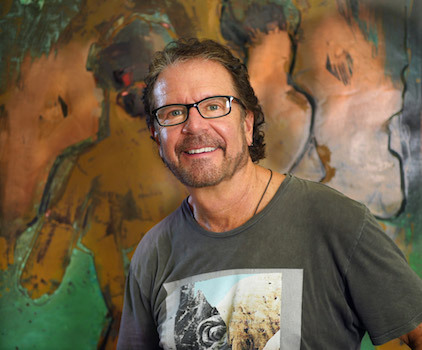 Trained at Chouinard Art Institute and the Art Center College of Design, he has also studied with nationally-recognized teachers including Rex Brandt, Robert E.Wood, Frank Webb, Steve Quiller, Don Andrews, and Eric Wiengardt. Jim is a signature member of the National Watercolor Society, Watercolor West, and the San Diego Watercolor Society. He regularly teaches, exhibits and conducts workshops throughout Southern California, as well as semi-annual ‘getaway’ workshops in Julian. 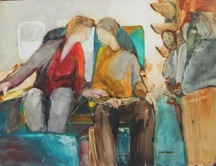 His paintings are loose and expressive, exhibiting the freshness and fluidity typical of the California Watercolor Style. Jim’s teaching approach is one of enthusiasm and guidance, stressing principles, application, planning, and the best qualities of watercolor. 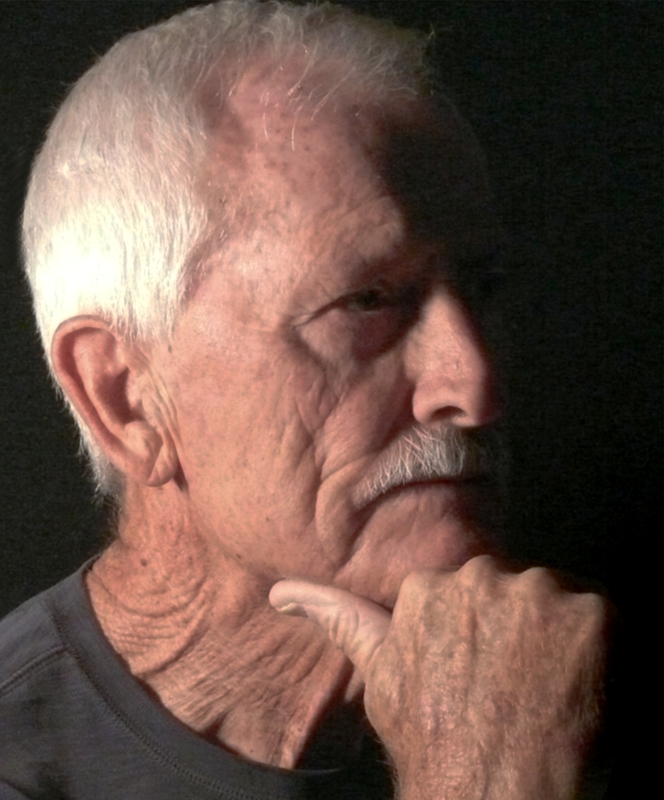 A dedicated teacher and lifelong student himself, Millard feels that the gift we have been given to express ourselves needs to be nurtured with an understanding of the underlying principles of good art in order to paint with authority. 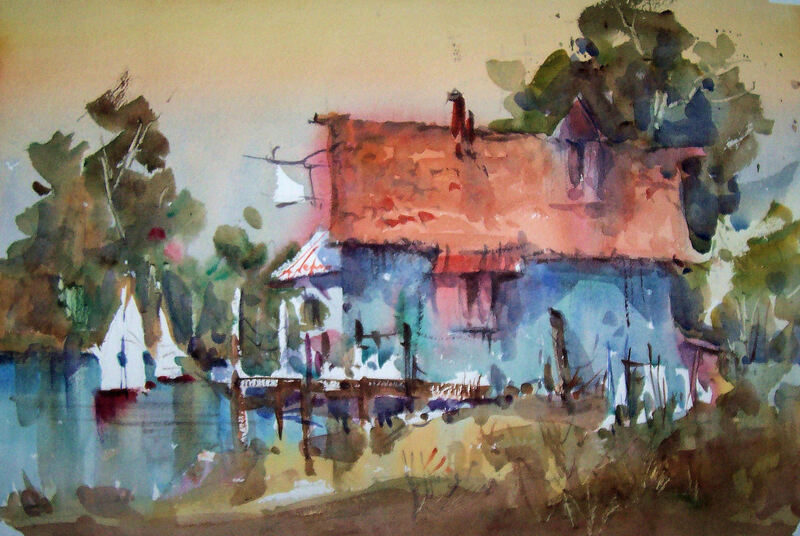 Internationally recognized artist Mark E. Mehaffey is a signature member of the American Watercolor Society; Dolphin Fellow, the National Watercolor Society, Watercolor USA Honor Society, the Transparent Watercolor Society of America; Signature Life Member - Master Status, Watercolor West, the Rocky Mountain Watermedia Society, the Louisiana Watercolor Society; Signature Life Member, the International Society of Experimental Artists, Signature Life Member and the International Society of Acrylic Painters. 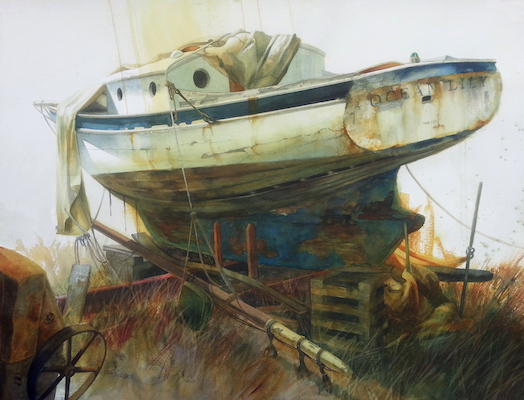 Mehaffey has won numerous international awards including the Silver Medal of Honor and the Arches Paper Co Awardfrom the American Watercolor Society, the Beverly Green Memorial Purchase Award from the National Watercolor Society, M. Grumbacher Gold Medal from Allied Artists of America, the Skyledge Award from TWSA, Biennial Award from the Shanghai Zhoujiajiao International Biennial Watercolor Exhibition, Best of Show from the San Diego Watercolor Society and guest artist for the Salon De L’Aquarelle 2015, Antwerp, Belgium. 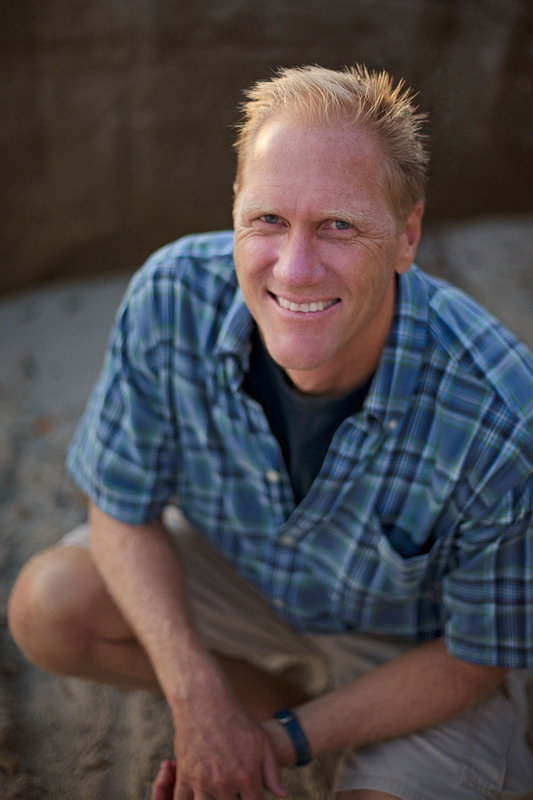 Mark has created twelve instructional videos and appeared in many publications. His paintings are included in several corporate public and private collections including Blue Cross Blue Shield and The Arches Paper Co., USA. Mark is a popular juror, workshop instructor and lecturer. For a complete bio visit Mark's website. 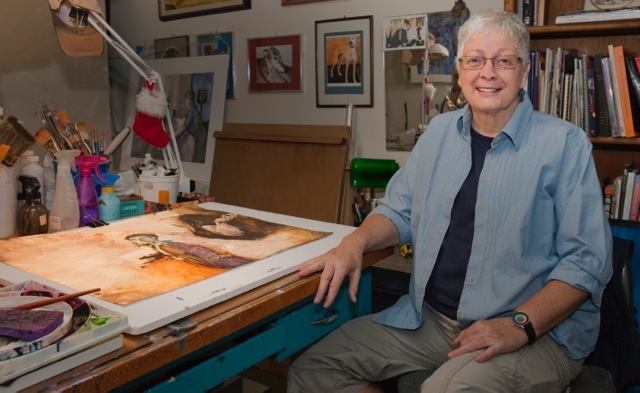 Stan Goudey, a member of the American and San Diego Watercolor Society is an award-winning painter who's been a professional artist for 47 years. 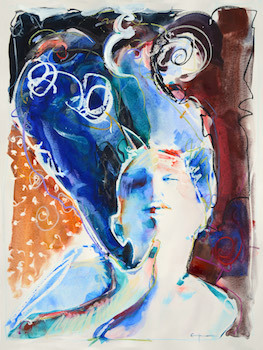 Goudey is proficient in oil and acrylic as he is in watercolor and even though acknowledges that each of these mediums requires a different mindset, he considers his fluency in various techniques to be a vehicle of self-expression and not an end to itself. Goudey hasn't much use for the promotion of a medium for its own sake or for the "tricks of the trade" emphasis on technique that can accompany "the end in itself" point of view. He says, "art for art's sake has never had any fascination for me and although I enjoy my materials and the act of painting, I view these things as a means to an end, namely self-expression." Goudey is known for showing his deeper self through his work. All is expression to this painter. On the subject of self-expression Goudey says, "Unless I am doing a painting demonstration for class, I paint only what I have an emotional connection with. I paint railroad pictures because I grew up watching trains and I love them. I paint landscapes and figures in interiors because I love the way the light falls on these elements and the way it makes me feel." Mood is a big part of Stan Goudey's expressive painting language. A viewer can spot a Stan Goudey painting in the gallery full of other artists' work by this clearly presented mood in the painting. He believes that it is the artist job to put the mood in a painting, the mood of the subject or place he is painting and the feeling within himself as he works. 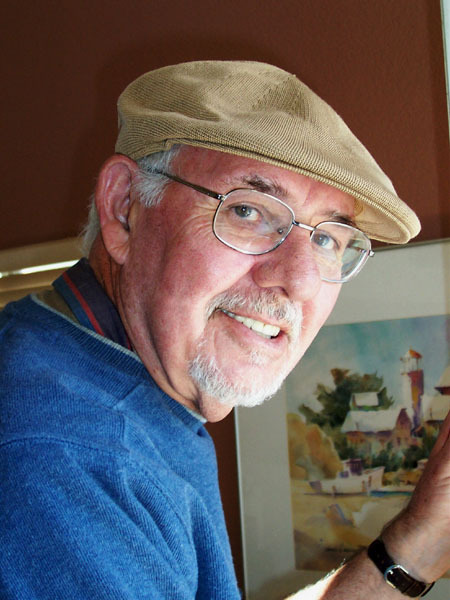 Stan Goudey teaches watercolor and acrylic classes and workshops in San Diego and in the mountains of Julian. 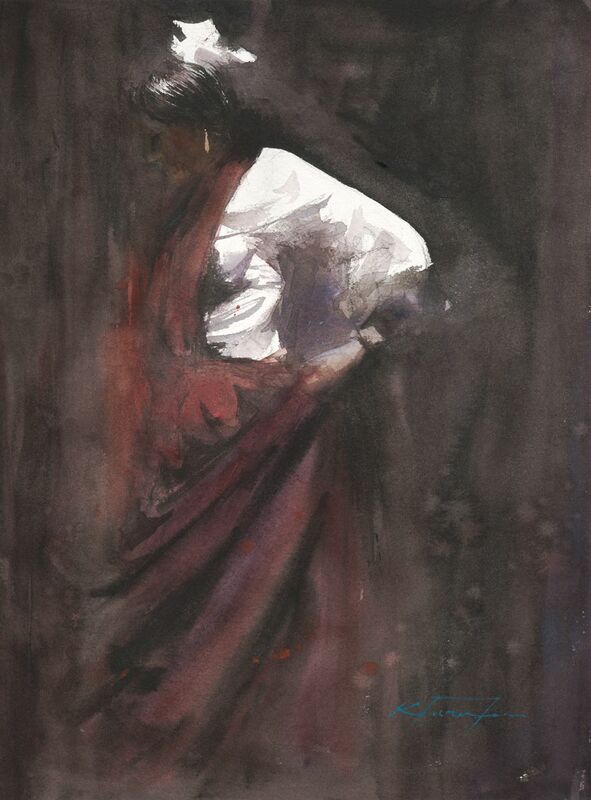 Robin paints the figure using controlled wet-in-wet washes in a large format. She uses a very limited palette and puts down an arbitrary first layer, then paints the subject on top of that. The first layer provides surprises, challenges, and movement under the transparent painting of the subject. Her work has been featured in the following magazines: International Artist, Watermedia Focus, The Palette, Watercolor and Watercolor Highlights. 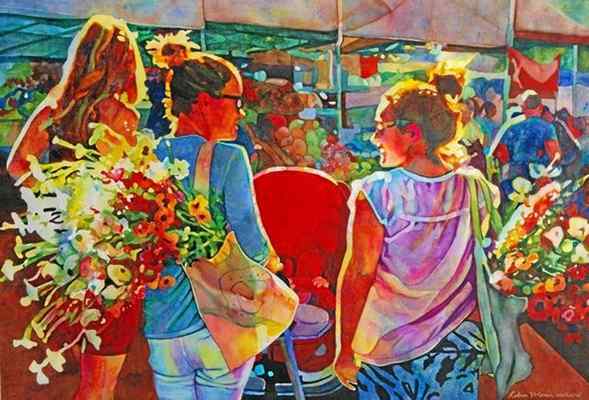 Her paintings have won awards in many national exhibitions, and she is a Signature Member of Watercolor West, the National Watercolor Society, the Northwest Watercolor Society and the San Diego Watercolor Society. She lives in Palm Desert, California. You can learn more about Robin and view more of her work at her website.